Why is cold water entering the radiant system from the domestic supply? The open system uses one heat source, your domestic water heater, to provide both floor heating and domestic hot water. The two systems are basically tied together. The same water that ends up in your hot shower or dishwasher, for example, has passed through the floor first. This is a very efficient system because one heat source is doing all the work. As long as the water heater is sized appropriately and matches your heating and domestic needs, the need for a “separate” heating system is eliminated. You’ll notice that cold water from your domestic supply enters the water heater via the floor tubing. We plumb the radiant system this way so that there’s never any chance of stagnant water entering your domestic system. Fresh water enters the tubing every time you use hot water. And although it looks at first glance as if cold water will be cooling down your floor, in reality that won’t happen. The only cold water that can enter the tubing will be the “make up” water to your water heater. 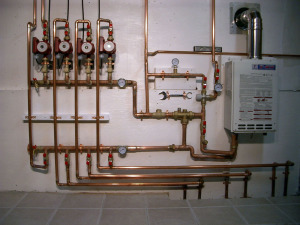 If no hot water valves are open in your domestic system, the radiant system is essentially “closed”. In other words, cold water cannot enter the system unless it has somewhere to flow….an open hot water valve in the house somewhere. 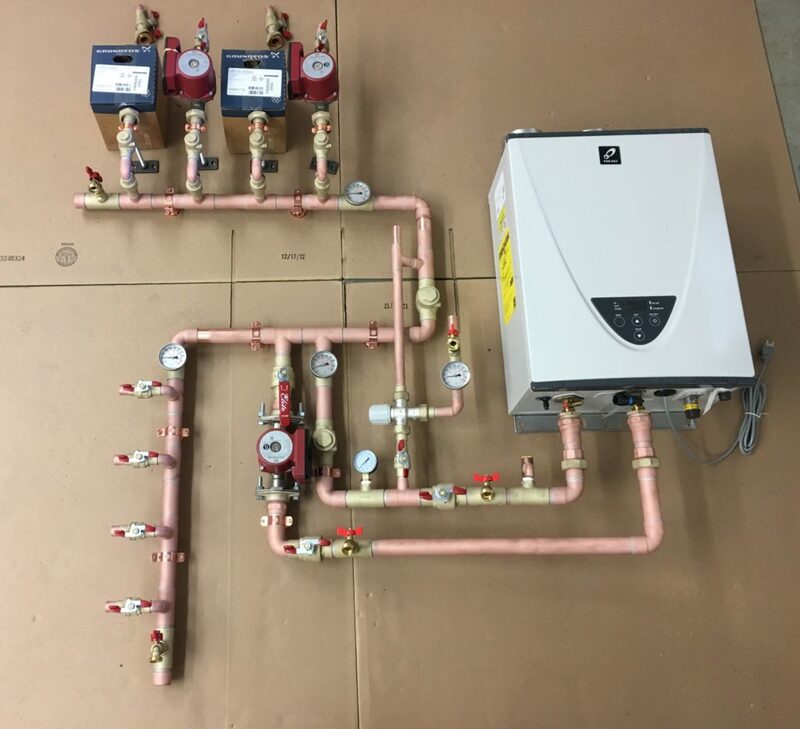 Without an open hot water valve, only the circulator pump supplying the radiant tubing can force water from the water heater into the tubing, and back, when your zone calls for heat. So, when you use hot water, cold water enters the water heater via the floor. This assures that fresh water is always flowing through the system, even in the summer. Keep in mind that any hot water displaced by the cold make-up water eventually works it’s way to the water heater, so there’s no net energy loss. And due to the large thermal mass in the floor, the small amount of cold make-up water entering the tubing has no chance of cooling down the floor….unless of course you were to take a four hour shower. That’s not likely. 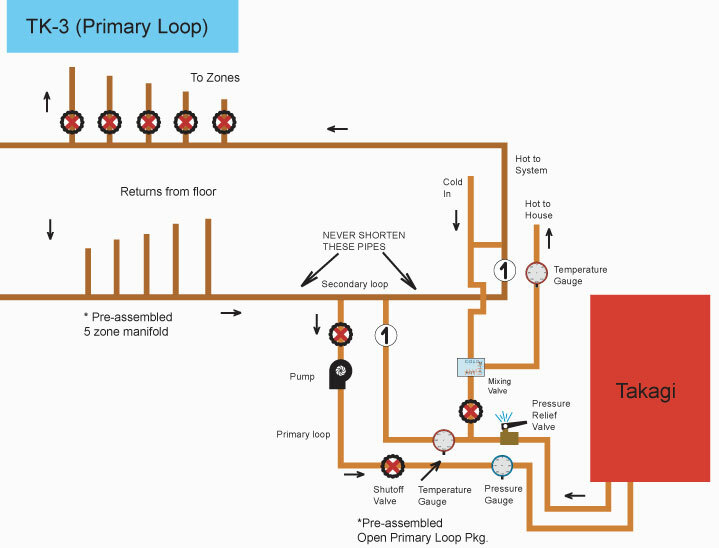 Also remember that if the thermostat in the zone is calling for heat at the same time you’re using hot water, then the circulator pump will still be pumping hot water through the loops and the net result will be warm water entering the tubing instead of cold. By the way, one of the easiest and least expensive ways to protect components in open systems, to say nothing of the home’s plumbing fixtures, is through the use of a whole house filter. Common canister-type housings are available at any hardware store and a 20 micron filter will effectively remove silt and other particles from the home’s incoming water. And while we’re on the subject of water, it’s important to remember that all plumbing systems, whether for domestic hot and cold water or hydronic heating, are subject to various environmental factors. The water’s mineral content (“hard” or “soft” water), PH (acidic or alkaline), and additives like chlorine can all affect the copper, galvanized, or plastic components in domestic water systems, including PEX tubing. And although cross-linked polyethylene (PEX) is among the most durable of all these components, there are circumstantial reports that high concentrations of chlorine, in a tiny fraction of cases and specific to municipal water supplies, may have degraded PEX tubing. This can potentially affect “open” radiant systems supplied by municipal water departments. So, if you have reason to believe that your municipal department treats the local water with higher than normal degrees of chlorine (4PPM), you may want to consider a “closed” or “heat exchanger” heating system. 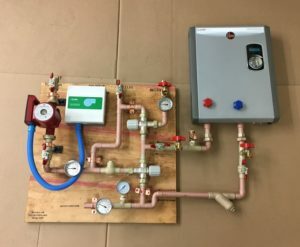 Both these system types allow the homeowner to charge the radiant system with any water they choose (distilled, or spring water, or water from some other low mineral or non-chlorinated source). No. That’s because our circulators are very low wattage, non self priming pumps. They can stir water around a radiant system, but they can’t compete with normal domestic water pressure. As a result, domestic hot water uses always take precedence. Four zone open system using a Polaris high-efficiency water/space heater. 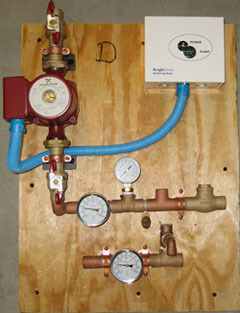 Open 2-zone system with primary loop AND circulating loop for domestic hot water. Even large, high volume radiant systems can use a properly sized on-demand water heater. The below schematic details our “Primary/Secondary” plumbing configuration in an open system (i.e. heating and domestic hot water from a single unit). Examples of multiple zone systems with primary loop. Pictured above are a few examples of our “Radiant Ready” single zone Open Systems. 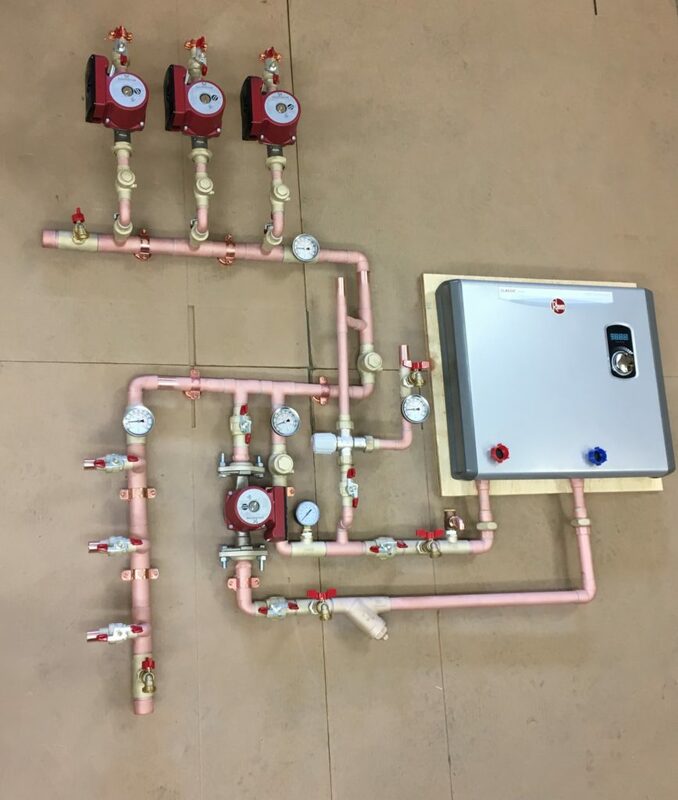 This pre-assembled, panel system comes right out of the box just as you see it here, including pump, pre-wired controller, various valves and gauges. The entire system is pressure tested against leaks and as few as five solder connections can tie it into your system. Over the last few years, on-demand water heaters have evolved into extraordinary heat sources. They are much more efficient (95%) than tank-type water heaters (75% or less for most models), and they’re smaller, more powerful, vent with PVC pipe, and importantly, they don’t suffer from “standby loss”. Unlike tank-type water heaters, on-demand units are computer controlled and can modulate their burners in response to incoming water temperature to maximize efficiency. They also come with built-in digital displays that show gallons per minute flowing through the unit (useful for diagnostics), incoming and outgoing water temperature, and even flash error codes when something isn’t right. Raising or lowering the output temperature is as simple as pushing a button. The above schematic details all the components in the “Open System”, followed by a photo that shows how the system ties into the Zone Manifold. Hot water from the on-demand unit enters mixing valve #1 (valve on the left) where it is tempered to whatever temperature the floor requires. Hot water from the on demand heater also supplies mixing valve #2 (upper valve) so the household’s domestic hot water can be cooler (or hotter in some cases) than the floor water. 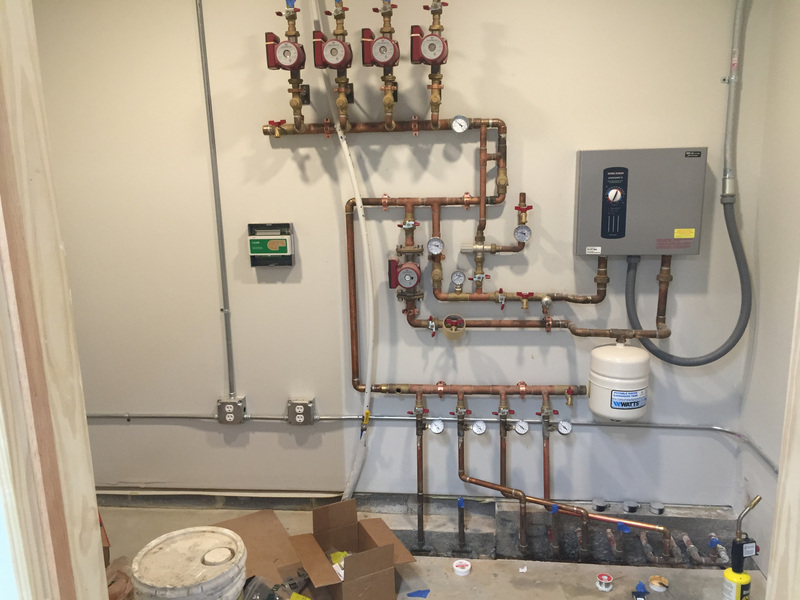 This plumbing configuration gives the homeowner total control over the heat output for both space heating and domestic hot water. The photo below illustrates another style of on-demand water heater, but instead of gas as the fuel, it uses electricity. This Electric unit is specifically designed for radiant floor applications and in regions of the country (the Pacific Northeast, for example) where electricity rates are low (.07 per KWH or below), an electric on demand heater would be an excellent heat source choice. Radiant Floor Company also makes pre-assembled “Radiant Ready” single zone systems in 38 configurations. 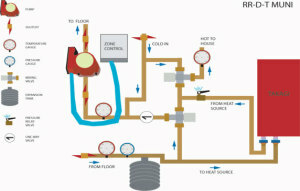 The photo below is a Radiant Ready specifically designed for an on-demand water heater. The cost of the ALPHA series pumps have dropped dramatically and the price is now within the range of many conventional radiant circulators. Radiant Floor Company will design ALPHA circulators into our radiant system whenever possible so our customers can enjoy a 50-75% savings on the cost of running their pumps. 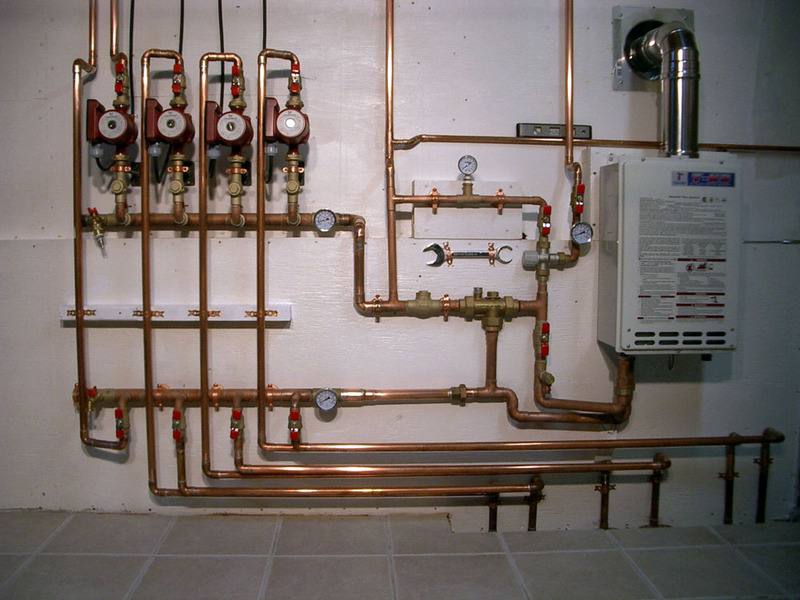 The open system is plumbed into the home’s domestic water supply, so the best way to fill new radiant tubing is to open a HOT water valve somewhere in the house. When hot water is drawn from the domestic water heater (on-demand or tank-type), cold water flows in to replace it. 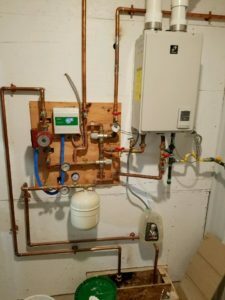 But instead of going directly to the water heater, in an open radiant system, that fresh make-up water flows through the radiant tubing first. This eliminates any possibility of stagnation in the system, yet still has no detrimental effect on the heating system. So, as a result of this plumbing configuration, only the hot side of your domestic system can purge air from the newly installed radiant tubing. That makes filling the open system easier than filling a closed system because there’s no need for hoses, utility pumps, or buckets of premixed anti-freeze. But you still want to follow the same procedure as you would for a closed system, that is, fill the open system one zone at a time, one circuit at a time. If you have three zones, for example, close the ball valves below the pumps for zones 2 and 3, and focus your water flow on Zone #1. Remember, just opening a domestic hot water fixture anywhere in the house will force water through the zone. If Zone #1 has multiple circuits of tubing and each circuit happens to have a ball valve before each circuit (like on the larger slab manifolds, for example), then close off all the circuits of Zone #1 except the first one and channel the water into that first circuit. When circuit #1 of Zone #1 has been purged, then close off circuit #1 and open circuit #2. Repeat this process for every circuit in every zone. Any stray air remaining in the system will be purged naturally over time by the household’s normal daily use of hot water. Also, keep in mind that if you’re using a new tank-type water heater, that heater will be full of air. Expect the purging process to last several minutes because you’re filling both the empty tubing and a very large tank. Open systems are part of the domestic plumbing system. They operate at the same pressure as the house supply, generally around 40 to 60 psi. We call the various valves in the above photo “isolation valves”. The two valves that look like hose bibs are boiler drains. One boiler drain is located on the upper (hot “out”) pipe just below a standard shut-off valve. The boiler drain on the lower pipe (cold/return “in”) is just above a second shut-off valve. These isolation valves allow the homeowner to “back-flush” the Takagi on-demand water heater with pure white vinegar as part of a periodic maintenance program, especially in regions with very hard water. The vinegar is slightly acidic and will break down mineral deposits that may have built up in the Takagi’s heat exchangers. 1. Close both shut-off valves. 2. Attach a short washing machine hose to each boiler drain. 3. Pour 2-3 gallons of pure white vinegar into a clean 5-gallon bucket. 4. Attach the hose from the “hot” (out of the Takagi) line to a submersible sump pump or a utility pump. 5. Run the hose from the “cold” (in to the Takagi) line into the 5-gallon bucket. When the pump is running, it will send vinegar IN the OUT port of the water heater and OUT the IN port, effectively back-flushing the heat exchangers. Allow the vinegar to circulate in this manner for several minutes. Alternatively, you can pump vinegar into the heater, close both shut-off valves, and allow the vinegar to sit in the heat exchangers for an hour or two. Finally, replace the vinegar with fresh water and flush the heater for 60 seconds. Don’t forget to open your shut-off valves at the end of this procedure. In homes with spread-out floor plans, the heat source is often a long distance from the hot water fixtures. Fifty, eighty, even a hundred feet of 1/2″ or 3/4″ copper pipe or PEX tubing can separate the user from the water heater. In extreme cases, several gallons of water vanishes down the drain before the hot water arrives, to say nothing of the long wait. The Circulation Loop solves this problem by circulating hot water in a continuous loop between the user and the heat source. One or many hot water fixtures then branch off the main loop and hot water becomes, in effect, instantly available. But of course this miracle consumes energy. A small pump (about 80 watts) is required for circulation and the loop itself can radiate a significant amount of thermal energy to the surrounding air unless it’s well insulated. Ideally, a timer activates the loop (pump) only during periods of significant hot water use, say, a few hours in the morning and a few at night. Many customers, especially in rural areas, are installing outdoor wood boilers and using them in conjunction with radiant floor heating. Normally, these boilers, via a heat exchanger, are plumbed into a storage/back-up tank that can take over the task of heating the water when the winter fatigued homeowner flies off to the Caribbean and becomes unavailable to throw wood into the boiler. If you have a standard outdoor wood boiler, the following schematic could be very useful. The heat exchanger is necessary in this system because the water in the wood boiler is chemically treated with an anti-corrosive agent. As a result, the boiler water must never come in contact with the potable water in the storage/back-up tank. Also keep in mind that, unless the wood boiler is a multi-fuel system (i.e. a propane or oil burner fires up when the wood supply burns down), the back-up tank should be a heat source powerful enough to meet the home’s total hot water and heating needs. The insulated supply and return lines from the wood boiler (black Ecoflex pipe) enter the room through an opening in the slab. A cast iron circulator pump (bottom left) sends the hot fluid into the top left inlet of the heat exchanger. An in-line thermometer shows the exact temperature going into the heat exchanger. From the bottom left outlet of the exchanger the water returns to the boiler. Notice the “existing system fill kit” plumbed into the return line. These valves make it easy to fill or drain the boiler when necessary. A second Stainless Steel circulator pump is installed on the domestic/heating side of the heat exchanger (upper right of photo). A sensor on the storage tank return line monitors the temperature in the tank. When the tank temperature falls below 140 degrees, the stainless pump is activated and heat is drawn from the heat exchanger. The other variation on the wood boiler theme is the “domestic hot water coil” within the boiler itself. Some brands of boiler offer this feature and, as long as wood is continually fed into the boiler, a separate storage tank for domestic hot water is not needed. The rise in fossil fuel prices has inspired many homeowners to invest in renewable energy technologies like solar. The schematic below demonstrates how a solar thermal array can interface with an open radiant system. This tank uses two internal heat exchangers to heat water for an “open” radiant system. In dual coil tanks, basically two closed systems are surrounded by potable water. Ideally, the lower (solar) coil heats the tank to a usable temperature, and the hot water is drawn off as needed for domestic and heating purposes. Fresh water enters the tank in direct proportion to the amount drawn off for domestic hot water. Obviously, when hot water is taken from the tank for radiant heating purposes, it simply returns to the tank for re-heating. Since solar, especially during the spring, summer, and fall, can heat the tank to near boiling, a mixing valve tempers the potentially scalding water to a safe level. On the other hand, if a period of cloudy weather or a lack of available sun (also called winter) prevents the solar from heating the tank to the desired temperature, the Takagi on-demand (back-up) unit heats the upper coil by using standard fossil fuel. Either way, hot water is always available for domestic or radiant heating purposes. Also, because this configuration is basically two closed (non-potable and/or anti-freeze) systems interfaced with pure, drinkable water, the components needed in any closed system are included in this package, i.e. expansion tank, air eliminator, fill/drain valves, etc. Speaking of closed systems attached to “open” systems, some radiant applications require the use of anti-freeze. Examples would be melting snow from driveways, walkways, and stairs; heating remote buildings like workshops and greenhouses via underground, insulated lines…..or basically, any heating task demanding freeze protection. Obviously, these zones can’t intermingle with the potable water of an open system. 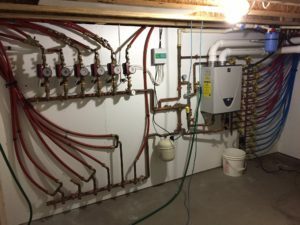 Normally, for the sake of efficiency (heating with anti-freeze is 15% less efficient than heating with pure water), you don’t want your entire radiant system to use anti-freeze just because one or two zones may need it. The solution is a heat exchanger heated by one leg of the open system Zone Manifold ( see above schematic ). The heat exchanger transfers heat from the potable water to the anti-freeze without mingling the two fluids. In the pictured snow melt system, note the XPS (extruded polystyrene) insulating foam below the tubing and, just as important, the vertical pieces of foam along the edges of the future slab. 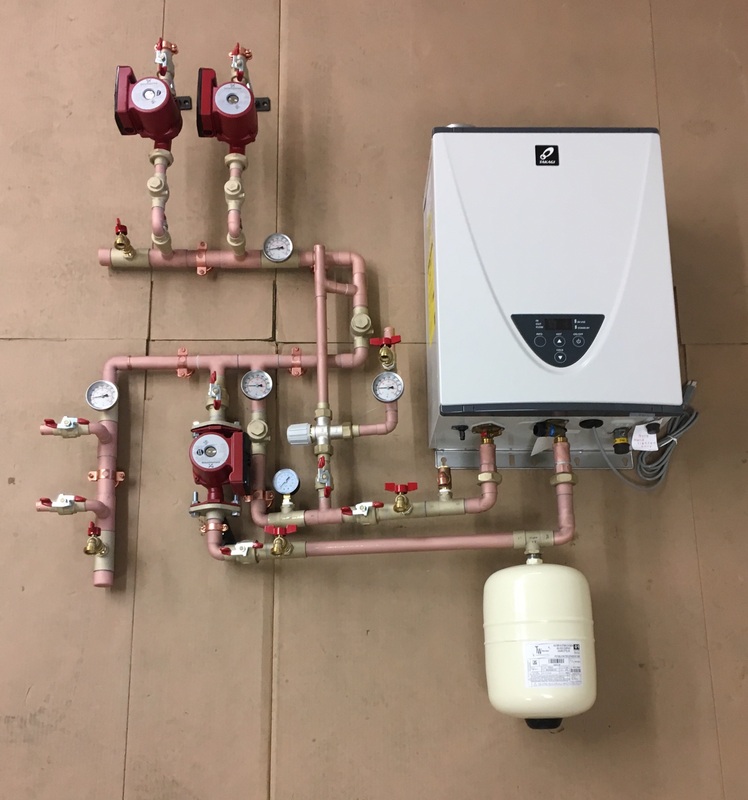 In all radiant heating applications, and especially in energy intensive uses like melting snow and ice, it’s crucial to contain the heat and direct it to its primary task. In this case, melting snow from the concrete driveway and not wasting precious heat on the soil below and along the edges of the slab is worth the high cost of abundant insulation. It’s amazing how layered some heating systems can get. In their quest for maximum efficiency, effectiveness, and versatility, some customers tie as many as three different heat sources (in this case, solar, wood, and gas) into a single system. The following schematic illustrates how this can be done. Notice also how a “high” temperature heat emitter (fan coil or baseboard radiator), can interface with a “low” temperature emitter (radiant floor) by the strategic placement of a mixing valve. And because this is an open system, domestic hot water is provided as well.